Today, the Artistic Outpost Design Team is sharing projects created with the stamp sets from the Spring Release. My card uses the Harvest and Grunge Elements stamp sets from the Spring Release, the butterfly from the Happiness stamp set and Our Daily Bread Designs Paper Collections and Custom Dies (see supply list below). The sweet girl from the Harvest set is Coffee embossed on Vanilla card stock and paper pieced using scraps from the Blushing Rose paper collection. 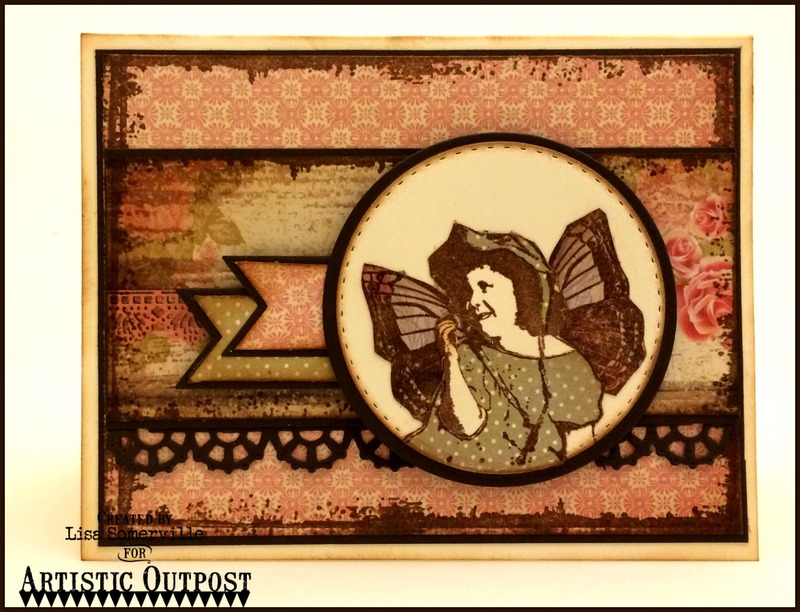 I Coffee embossed the butterfly from the Happiness stamp set on a scrap from the Shabby Rose paper collection, then added it behind the girl. I placed the image on a Vanilla panel then die cut using the Double Stitched Circles dies, sponged the edges then placed on an Espresso panel that was die cut using the Circles dies. Lisa, what a fun card!! Love the butterfly wings on this sweet girl image along with all of the pretty colors and other elements in your design- just fabulous! This is a lovely card Lisa, love the addition of the wings to this sweet girl. Gorgeous papers too. Lisa, this is just a sweet card! The layers are so lovely and the added wings on that little Harvest girl is perfect! Love this card!